Leaves of the Trees: coffee, scarves, pumpkin spice and everything nice. coffee, scarves, pumpkin spice and everything nice. I've been waiting since the first hot day of summer for this day, cool weather. While I love the cold weather, Kendall can't stand it. He is truly a jungle man. My poor man can't stand the temperature to get below 75, yes you read that right. I have a feeling he may go into hibernation when he moves up here next fall with me. How wonderful is that thought? Next year I won't have to worry about long distance anymore! This makes my heart happy, its been rough lately. It will all end soon enough. We're finally on the downside of wedding planning, about 6 months left, just SIX! I still have lots to do before then. I got a wonderful goodie in the mail the other day. I ordered it about a month ago and it came in just in time for the cold weather. As you can see it is a wonderful scarf. 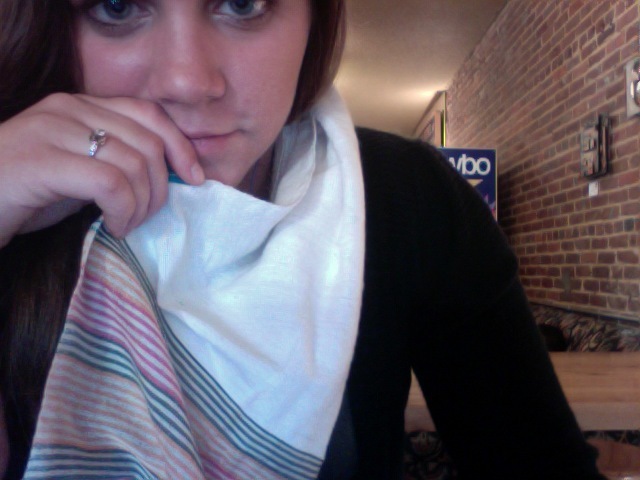 I mean, its pretty plain and simple but this scarf has a beautiful story (read it here) behind it. This scarf was made by a young girl named Bezuayhu. She lives in Ethiopia and she handmade this scarf. A wonderful organization I'm in involved with called Mocha Club helps women provide jobs for themselves by helping them sell scarves to people in the states and giving the profits to the women. Not only does it help them and their families and communities, it helps stimulate their economy as well. Mocha Club supports different projects as well, I encourage you to check it out and see what $7 a month can do. I need africa more than africa needs me.